A quasar – nicknamed the Teacup because of its shape – is causing a storm in galaxy about 1.1 billon light-years from Earth. The power source of the quasar, astronomers say, is a supermassive black hole at the galaxy’s center. The Teacup’s host galaxy – officially known as SDSS 1430+1339 – was discovered in 2007. New data from Chandra and ESA’s XMM-Newton mission are giving astronomers an improved understanding of the history of this galactic storm. A study describing these results will be published March 20, 2019, in The Astrophysical Journal Letters (preprint here). Read more about what astronomers are learning about the Teacup from the Chandra X-Ray Observatory here. This new composite image contains X-ray data from Chandra (blue) along with an optical view from NASA’s Hubble Space Telescope (red and green). The “handle” of the Teacup is a ring of optical and X-ray light surrounding a giant bubble. This handle-shaped feature, which is located about 30,000 light-years from the supermassive black hole, was likely formed by one or more eruptions powered by the black hole. Image via NASA/STScI/W. Keel et al. 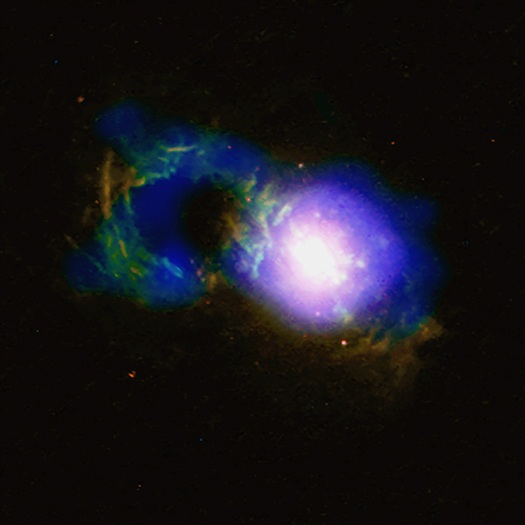 Bottom line: A quasar nicknamed the Teacup is causing a storm in a distant galaxy.